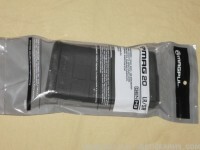 Magpul M3 7.62 Nato 15/25 black window P-Mag. A 15 round limiter has ..
Magpul M3 .308 15/20 black P-Mag. A 15 round llimiter has been installed and the floo..